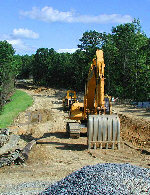 Construction of the largest section of the rail trail started on September 29, 2003. 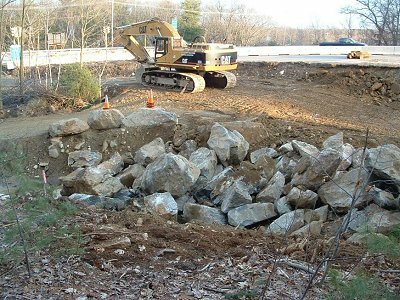 The $3,300,000 Mass Highway contract built all 3 miles of the trail in the Town of Hudson and the last unfinished 1 mile in the City of Marlborough. Follow the ongoing trail construction on this page. Clicking on each thumbnail will display a larger picture. May 25, 2010: The Route-62 bridge replacement in Hudson is finished, with the new ARRT bike lane now open. It closes what was a 100 yard gap in the trail since the Hudson section opened in 2005. Construction took 3.5 years! 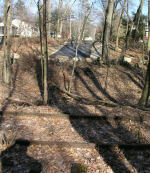 March 22, 2008: In December, Acton extended the cul-de-sac at the end of Sylvia Street with a short paved connection to the Acton ARRT right-of-way. This will become a secondary pedestrian & bike access to the Acton trail when it is completed. Note that there is no on-street parking on Sylvia Street. The railroad tracks are at the bottom of the photo, where the rail trail will be located. 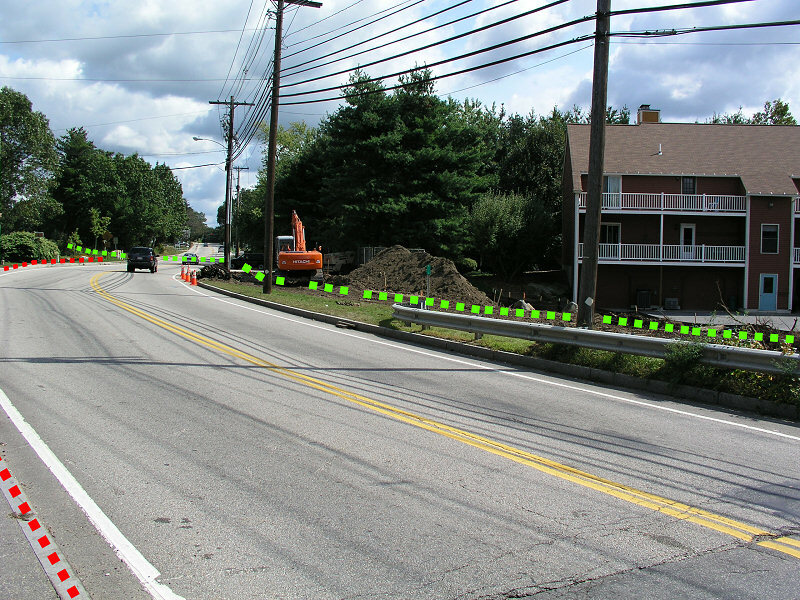 September 15, 2006: The replacement of the Main Street - Route 62 highway bridge in Hudson started. 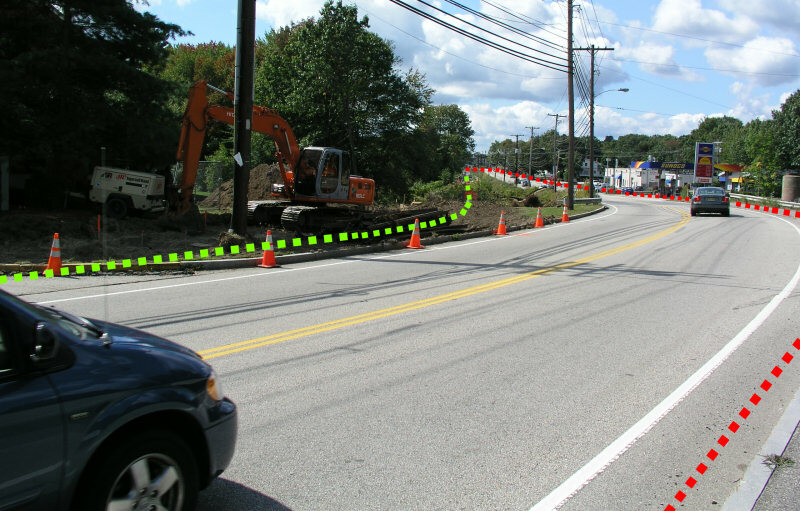 This MassHighway project widens and straightens out the existing road bridge. When finished in 2008, the bridge will be 10 feet wider than the existing bridge, to accomodate the rail trail in a much safer alignment. As the new bridge is shifted 10 feet to the south, the abandoned RR trestle will be removed. Standing on the old bridge, facing east, the 2008 trail alignment is marked in green dots on the right side of the bridge. The current temporary (2005-2007) path is on the left side, in red dots, down the north sidewalk. In the distance, a new trail crossing of Route 62 will have a pedestrian traffic light. Standing on the old bridge, facing west, the 2008 trail alignment is marked in green dots on the left side of the bridge. The current temporary (2005-2007) path is on the right side, in red dots, down the north sidewalk. August 30, 2006: The Hudson High Bridge was closed for a week, to put the final surface coating on top of the wood planks. The special non-asphalt traction material was delayed from 2005, due to problems with the original manufacturer. August 22, 2005: Site preparation for the arrival of the caboose. The 1921 historic structure was donated by the Edaville Railroad and will sit on the set of rails visible in this picture. 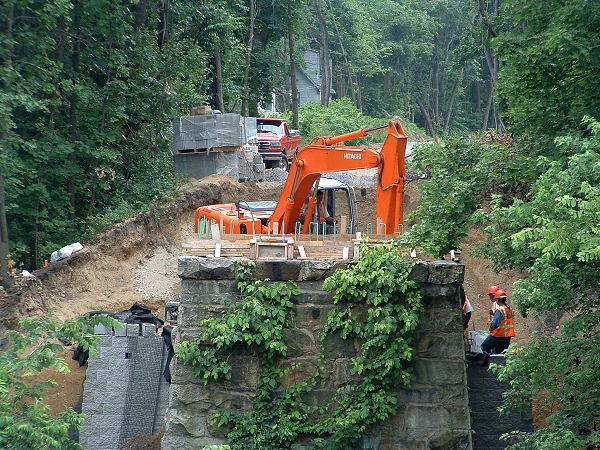 June 28, 2005: Hudson High bridge retaining wall. Workers wait while excavator backfills another level of new retaining walls at south abutment of high bridge. The north wall is done. 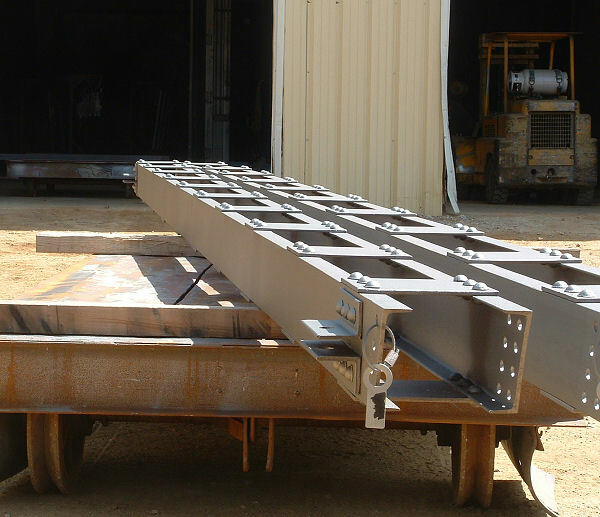 May 12, 2005: Silver bright: Shiny silver bridge support columns emerge from sandblaster. Restoration of the Hudson trestle bridge is almost finished. All the structural iron is being sandblasted and repainted at BC Industries in Oxford Mass and returned to Hudson this summer. 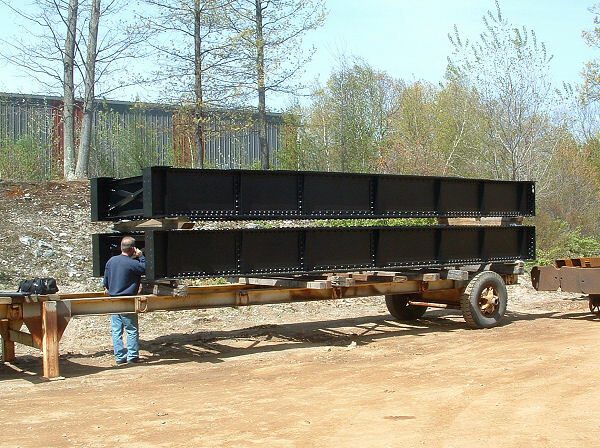 May 12, 2005: Inspecting paint: state inspector checks black polyurethane paint job on 2 bridge sections. May 6, 2005: The section of the trail beside Vila do Porto being paved. Reloading the paving machine. 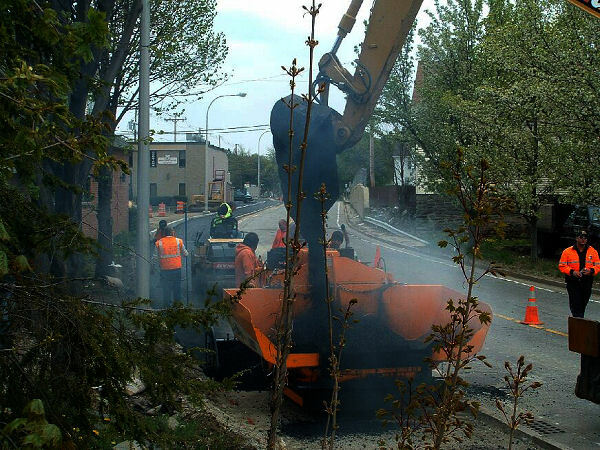 An excavator scoops fresh asphalt into the paving machine while the pavement roller pauses. 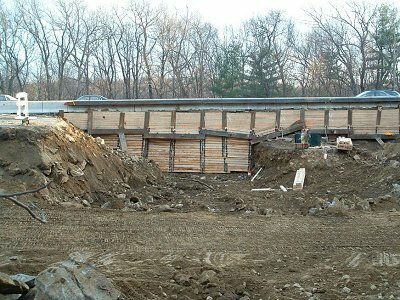 November 12, 2004: Construction has reached the 'Farmers Bridge' in Hudson. It will involve removing the bridge decking above the trail, without damaging the bridge stone work. 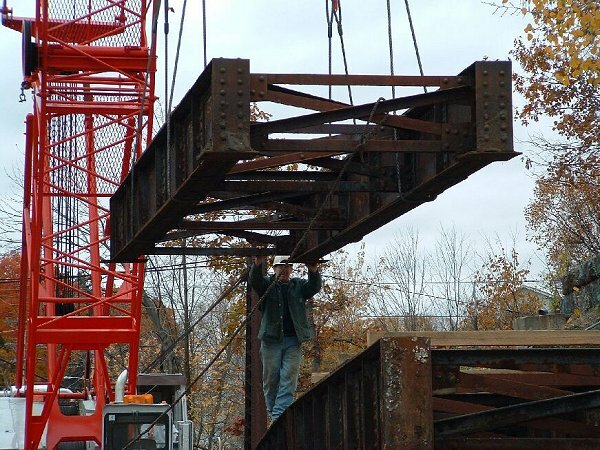 November 2, 2004: Dismantling the Hudson trestle bridge started. It will be cleaned and painted off-site and then reassembled for the trail. The bridge is one of the last 2 cast iron RR bridges in the state. 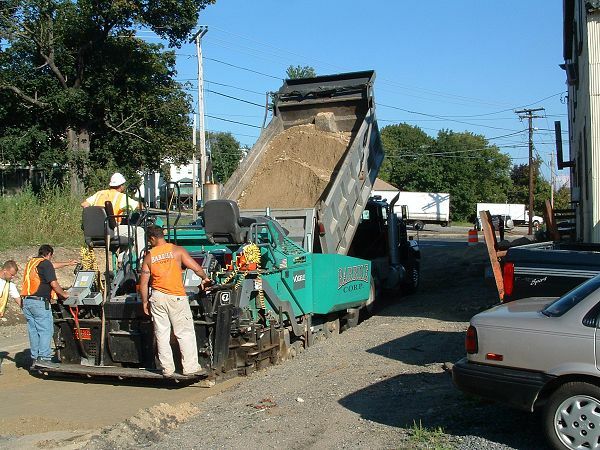 August 2004: The first of the paving in Hudson started. Facing west, here is the trail next to Route-62 at the Sonoco station. 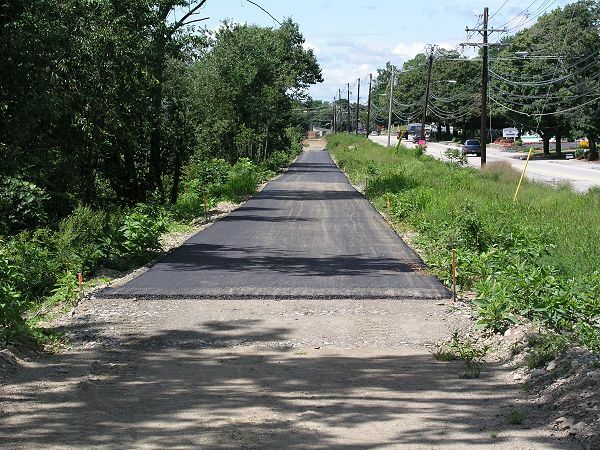 All of the trail paving in Hudson and Marlborough is scheduled to be finished in late fall. 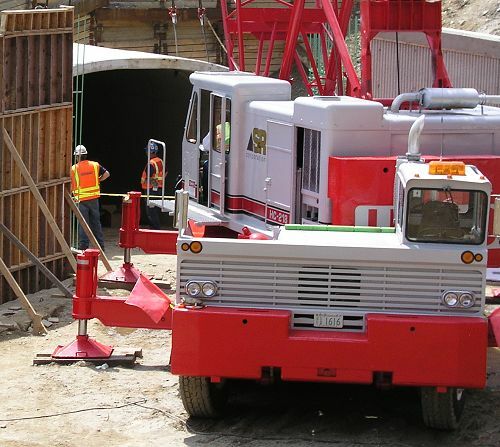 August 2004: Last of the tunnel sections is lifted in place. June 2004: The north entrance is finished and highway traffic is diverted again. Construction starts on the south entrance. 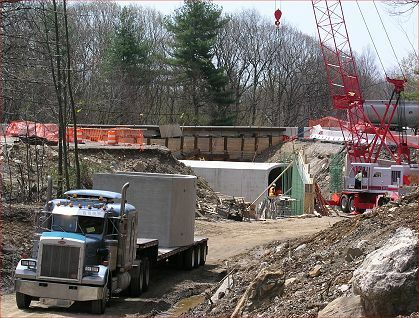 April 2004: The precast tunnel sections on the north side of the I-290 Connector were lifted in place by crane. April 2004: The S&R crane operator positions the 2nd to last section. 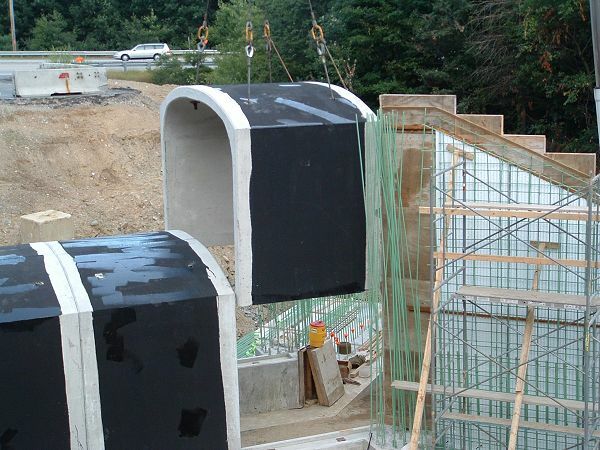 April 2004: Each of the 6 tunnel sections had to be trucked in, one piece at a time. January 2004: Construction workers from S & R Contracting. January 2004: In below zero temperatures, most of the tunnel approach digging is finished. 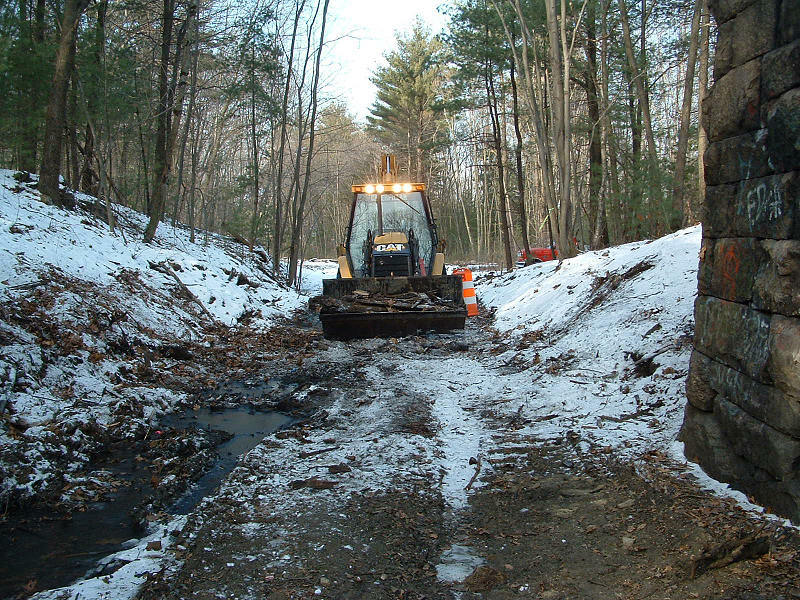 January 2004: Clearing RR ties near Route-85 in Hudson. 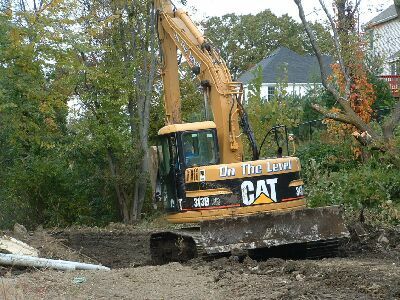 December 24, 2003: Site preparation work for the bike tunnel under the I-290 Connector highway. 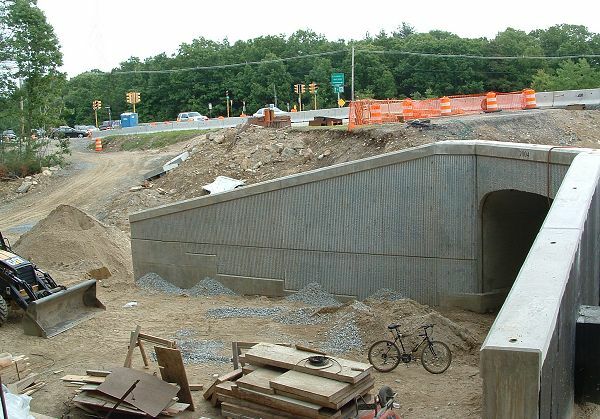 At 75 feet, it will be the longest bike tunnel in Massachusetts and require interior lights. December 24, 2003: Site preparation work for the bike tunnel under the I-290 Connector highway. 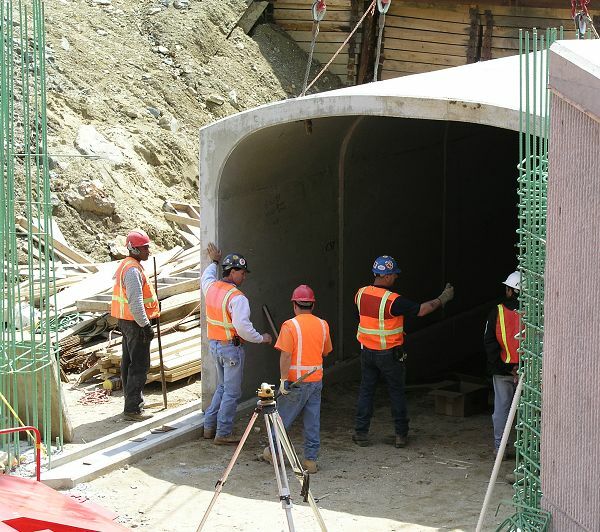 The pre-cast concrete tunnel sections will pass under 4 lanes of highway. 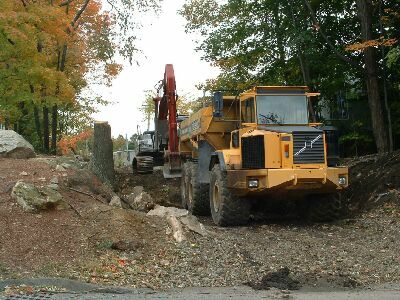 10/17/2003: Excavators pulling up tree stumps near the Hudson St crossing in Marlborough. 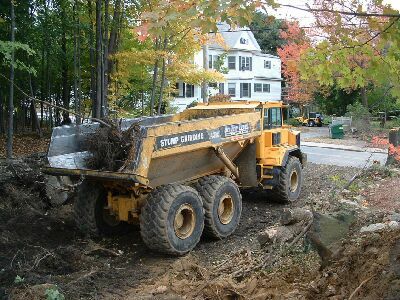 10/17/2003: Off-road dump truck near Hudson Street crossing in Marlborough. 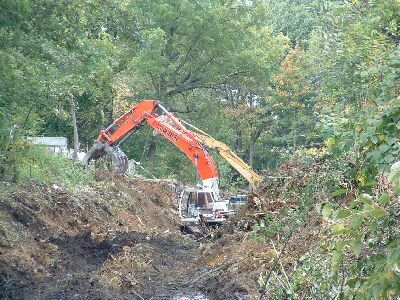 10/17/2003: Large excavator and dump truck near Hudson Street crossing, ready to load and remove stumps to chipping site. 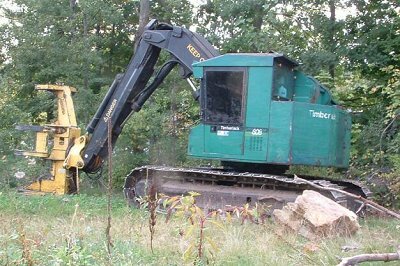 9/29/2003: A John-Deere "Timberjack" tree removal machine at Ash Street crossing ready to start tree clearing. August 2000: Construction of the first phase of the trail, 3/4 of a mile in Marlborough starts.